By Fred Lauener, Caritas Switzerland, reporting from the Egyptian-Libyan border, where Caritas is distributing emergency aid to migrants fleeing the unrests in Libya. Yesterday, a lot of people had to pack their stuff at the Salloum border camp. Salloum looked like a crowded, badly-organised coach station. Dozens of buses were obstructing the access to the camp. There has been a lot of movement here in the last days. A lot of people could finally leave. Among them were many of the young men from Chad who were by far the biggest group in the camp. A lot of them had come to Salloum not only because they had lost their jobs but most of all because they were fearing for their lives. Young black Africans are under general suspicion as Gaddafi mercenaries. 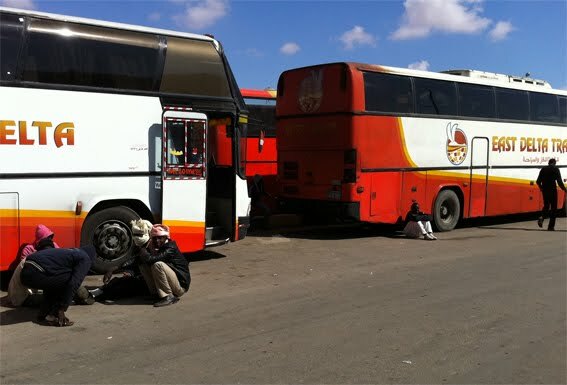 Full coaches heading to the airports of Marsa Matrouh or Kairo were leaving the camp by the hour yesterday. On Saturday, we still counted more than 6,000 people in the camp. Yesterday evening, only around 2,500 were left. That is good news. However, it should still take a while until the last family will have left Salloum. There are people from Iraq, Somalia or Sudan here, who cannot go home. There have to be found other solutions for them. And till then, we as Caritas will still be needed here.